Mission Beach offers miles of oceanfront boardwalk and a multitude of local experiences and outdoor activities for fun under the Southern California sun. Play in the surf at one of the area’s famous beaches, join in a game of beach volleyball, go fishing in Mission Bay, ride a historic seaside roller coaster at Belmont Park or learn about orcas at SeaWorld® San Diego. 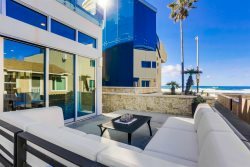 Check out these popular things to do in Mission Beach and Mission Bay during your getaway with Bluewater Vacation Homes. Founded in 1925, Belmont Park is a beachfront amusement park and home to the historic Giant Dipper roller coaster and Plunge swimming pool. The Giant Dipper is a 2,600-foot-long wooden coaster and reaches speeds up to 48 mph. Enjoy more than a dozen thrilling rides, attractions, casual restaurants and gift shops. Entrance admission and parking are free. As their flagship location, Wave House San Diego is an entertainment complex featuring FlowRider® and FlowBarrel® artificial wave technology. Surfers of all ages and abilities can practice their wave riding skills on indoor systems that generate the perfect conditions. Learn to surf or take your technique to the next level, watch the pros, listen to live music or grab a bite to eat in the restaurant. Also known as Oceanfront Boardwalk, the Mission Beach Boardwalk is a concrete walkway that spans about 3.5 miles from North Pacific Beach to South Mission Beach. Stroll along the scenic waterfront path that’s popular with tourists and locals alike and take in the sights. Enjoy biking, skating, skateboarding and jogging. A variety of bike and skate rentals are located nearby. Spread across 190 acres in Mission Bay Park, SeaWorld is one of the most popular marine parks in the world and offers one-of-a-kind attractions, fun rides, shows and up-close animal interactions. Some of the park’s top attractions include Orca Encounter, the Manta roller coaster and Sea Lions Live staring Clyde and Seamore. Situated next to Mission Beach, Mission Bay Park is the largest artificial aquatic park in the country. It stretches over 4,235 acres and features 27 miles of shoreline, 19 of which are sandy beaches with eight locations designated as swimming areas. Enjoy boating, swimming, biking, playing sports, picnicking and more. As a spotted bay bass paradise, Mission Bay is one of the most popular locations in San Diego for fishing. Anglers can also fish for halibut, corvina and other sand-dwelling species. Fish from the shore at Bahia Point, Sail Bay and Quivera Basin, or charter a boat from Dana Landing. Local tip: Fish during the incoming or outgoing tide as the fish tend to be more active. Mission Beach and Mission Bay are San Diego’s water wonderlands offering aquatic adventures from swimming and kitesurfing to stand-up paddleboarding and scuba diving. But there’s plenty to experience on land too. Go for a picnic at Ski Beach, rollerblade along the boardwalk, play volleyball at Crown Point or run with your four-legged friend off leash on Fiesta Island. Surfing, bodyboarding, kayaking, boating, Jet Skiing, water jetpacking and flyboarding are also popular in Mission Beach and Mission Bay. Rent beach and water sports gear during your vacation with Bluewater.